To put it very simply, anyone can become an American, but only a Chinese can be Chinese - and that places an additional and significant barrier in the way of any essentially national global hegemony. 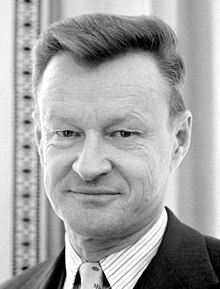 Zbigniew Kazimierz Brzezinski (March 28, 1928 - May 26, 2017) was a Polish American political scientist, geostrategist, and statesman who served as United States National Security Advisor in the administration of President Jimmy Carter from 1977 to 1981. This will require a review of our policy toward Pakistan, more guarantees to it, more arms aid, and, alas, a decision that our security policy toward Pakistan cannot be dictated by our non-proliferation policy. Memo to President Carter following the Soviet invasion of Afghanistan (1979). History is much more the product of chaos than of conspiracy. The New York Times, January 18, 1981 Quotation of the Day. Between Two Ages: The Technetronic Era, 1971. ...foreign policy of a pluralistic democracy like the United States should be based on bipartisanship because bipartisanship is the means and the framework for formulating policies based on moderation and on the recognition of the complexity of the human condition. That has been the tradition since the days of Truman and Vandenberg all the way until recent times. Address to the New American Strategies Conference, (October 28, 2003). 1970, Between Two Ages : America's Role in the Technetronic Era. Benchmarks are targets that have to be fulfilled. They cannot be fulfilled in an indefinite period of time, so there are timetables in benchmarks. PBS NewsHour, October 26, 2006 PBS Newshour (2006). On the "benchmarks" used by George W. Bush. The NewsHour with Jim Lehrer (January 11, 2007). [President George W. Bush] has a vision which can be described with two other words: Manichaean paranoia... the notion that he is leading the forces of good against the empire of evil, that in that setting, the fact that we are morally superior justifies us committing immoral acts. And that is a very dangerous posture for the country that is the number one global power. ... The fact is he squandered our credibility, our legitimacy, and even respect for our power. The Daily Show with Jon Stewart (March 14, 2007). I am very worried that most Americans are close to total ignorance about the world. They are ignorant. That is an unhealthy condition in a country in which foreign policy has to be endorsed by the people if it is to be pursued. And it makes it much more difficult for any president to pursue an intelligent policy that does justice to the complexity of the world. Spokespersons of US Right 'In Most Cases Stunningly Ignorant', Interview in Der Spiegel, December 6, 2010. Time, The Answers Issue (July 2015), p. 49. Spokespersons of US Right 'In Most Cases Stunningly Ignorant', Interview in Der Spiegel (December 6, 2010). We have a large public that is very ignorant about world affairs and very susceptible to simplistic slogans by candidates who appear out of nowhere, have no track record, but mouth appealing slogans. Morning Joe (July 13, 2011). This is a highly motivated, good country. It is driven by good motives. But it is also a country with an extremely simplistic understanding of world affairs, and with still a high confidence in America’s capacity to prevail, by force if necessary. (...) This is a country of good emotions, but poor knowledge and little sophistication about the world. Interview in The National Interest - Brzezinski on the Syria Crisis, Interview in The National Interest (June 24, 2013). You have to ask yourself, 'What was the desire of the people who, after more than 40 years of Soviet oppression, became free?' They didn’t want to be pawns between a residual West that ended somewhere on the borders of the old West Germany and a resurgent Russia. They wanted to be part of the democratic West and, eventually, of the European Union. Those are perfectly legitimate aspirations. This is no threat to Russia –- except to those Russians who cannot conceive of Russia as anything else but a dominant empire that rules not only over the Russian people but over those adjoining Russian territory. Interview in The Huffington Post - NATO Should Stop Putin From Restoring Czarist Empire, Zbigniew Brzezinski Says (September 3, 2014). Commenting on criticisms of NATO expansion to Eastern Europe. Chapter 1, Hegemony Of A New Type, p. 9. Chapter 1, Hegemony Of A New Type, p. 25. For America, the chief geopolitical prize is Eurasia. Chapter 2, The Eurasian Chessboard, p. 30. Fortunately for America, Eurasia is too big to be politically one. Eurasia is thus the chessboard on which the struggle for global primacy continues to be played. Chapter 2, The Eurasian Chessboard, p. 31. Chapter 2, The Eurasian Chessboard, p. 35. It is also a fact that America is too democratic at home to be autocratic abroad. This limits the use of America's power, especially its capacity for military intimidation. Never before has a populist democracy attained international supremacy. But the pursuit of power is not a goal that commands popular passion, except in conditions of a sudden threat or challenge to the public's sense of domestic well-being. The economic self-denial (that is, defense spending) and the human sacrifice (casualties, even among professional soldiers) required in the effort are uncongenial to democratic instincts. Democracy is inimical to imperial mobilization. Chapter 2, The Eurasian Chessboard, p. 35-36. In brief, for the United States, Eurasian geostrategy involves the purposeful management of geostrategically dynamic states and the careful handling of geopolitically catalytic states, in keeping with the twin interests of America in the short-term: preservation of its unique global power and in the long-run transformation of it into increasingly institutionalized global cooperation. To put it in a terminology that hearkens back to the more brutal age of ancient empires, the three grand imperatives of imperial geostrategy are to prevent collusion and maintain security dependence among the vassals, to keep tributaries pliant and protected, and to keep the barbarians from coming together. Chapter 2, The Eurasian Chessboard, p. 40. Chapter 3, The Democratic Bridgehead, p. 62. Chapter 3, The Democratic Bridgehead, p. 75. Chapter 4, The Black Hole, p. 104. Chapter 4, The Black Hole, p. 118. Chapter 4, The Black Hole, p. 122. The world's energy consumption is bound to vastly increase over the next two or three decades. Estimates by the U.S. Department of Energy anticipate that world demand will rise by more than 50 percent between 1993 and 2015, with the most significant increase in consumption occurring in the Far East. The momentum of Asia's economic development is already generating massive pressures for the exploration and exploitation of new sources of energy and the Central Asian region and the Caspian Sea basin are known to contain reserves of natural gas and oil that dwarf those of Kuwait, the Gulf of Mexico, or the North Sea. Chapter 5, The Eurasian Balkans, p. 125. The dynamic character of China's nonstatist economic transformation, including its social openness to the rest of the world, is not mutually compatible in the long run with a relatively closed and bureaucratically rigid Communist dictatorship. Chapter 6, The Far Eastern Anchor, p. 161. I encouraged the Chinese to support Pol Pot. I encouraged the Thai to help the Khmer Rouge. The question was how to help the Cambodian people. Pol Pot was an abomination. We could never support him. But China could. Elizabeth Becker, When The War Was Over..., 1979, p. 435  (Brzezinski responded in the letter the NYT clarifying his postion at the time: "China acted alone [... Becker's article] asserts flatly as if it was a fact that the Carter Administration "helped arrange continued Chinese aid" to Pol Pot.[...] we told the Chinese explicitly that in our view Pol Pot was an abomination and that the United States would have nothing to do with him directly or indirectly."). According to the official version of history, CIA aid to the Mujahideen began during 1980, that is to say, after the Soviet army invaded Afghanistan, 24 Dec 1979. But the reality, secretly guarded until now, is completely otherwise. Indeed, it was July 3, 1979 that President Carter signed the first directive for secret aid to the opponents of the pro-Soviet regime in Kabul. And that very day, I wrote a note to the president in which I explained to him that in my opinion this aid was going to induce a Soviet military intervention. James K. Galbraith, Democracy inaction, Salon.com (November 30, 2004). This page was last edited on 17 July 2018, at 10:40.